Tideswell has a number of shops from which you can buy supplies for a home-cooked slap-up meal whilst staying at The Old Piggery. And there are a range of pubs and eateries which you can also try. * Vanilla Kitchen is a local village cafe serving food and snacks and great coffee through the day. Open Weds thru Sunday. Dogs are welcome both inside and in the outside courtyard. * The Peak District Parlour is a cafe in the centre of the village open seven days a week. Run by Heather, they also have a deli counter where you can by local produce including items from our village dairy. Dogs welcome! * High Nelly’s is a great cafe for coffee and brunch in the centre of the village. Dogs welcome on the tables they have outside. * H&D Exotic Teas on High Street serves an incredible range of teas, plus other hot drinks and snacks. They have two small tables outside where you can sit with your dog. Look out for them opening on weekend evenings for meals – they do takeaways too! * The Merchant’s Yard is a new restaurant in Tideswell which also offers a private dining room and operates as a cafe during the day. * The George – one of the oldest Tideswell pubs, located next to the Cathedral of the Peak. Serves good food and beer. Has an outside seating area for when the sun is shining, and an open fire for cosy nights in. Dogs very welcome, inside and out. * The Red Lion, Litton. A short stroll from Tideswell, Litton is the next village along the valley and boasts a fantastic pub. Good food, great beer, and dogs are given a very warm welcome. This pub is great in the summer months, as there is ample outside seating overlooking the village green. * The Horse and Jockey in Tideswell is a traditional country pub, with good food, good ales and a roaring open fire. Dogs very welcome. 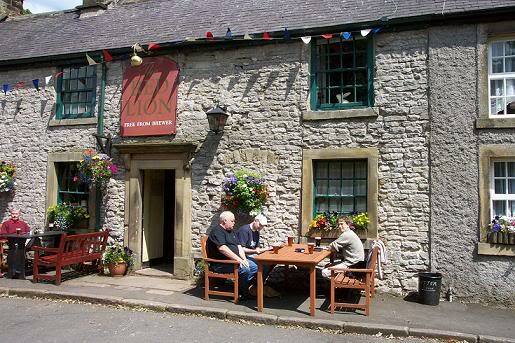 * The Star is another of Tideswell pubs serving good beer and hearty food. Run by the lovely Heather and Wayne, dogs are welcome in the bar on the right as you enter. You can test your brain cells at the regular Thursday night quiz night! * The Anchor is situated on the edge of the village, and serves traditional pub grub Dogs are allowed in the room on your left as you walk in. These links will take you outside of the comfy confines of our website, into the big wide web.We have no control over or responsibility for their content. However, if you find any of these links are broken, please contact us.